In this review we will show and give details about what is interesting and new from this firmware! Progressive Web Applications are advanced web applications which are downloaded as usual web pages or web sites, but they can provide user functions such as operation in offline mode, push notifications and access to hardware, normally accessible only for your own applications. Interface looks modern and beautiful now, and you can download it to control the panel fast directly from your smartphone screen. For quick and easy integration of outdoor panels into third-party systems (ACS, etc.) we have developed an API which duplicates all the functions that are in the web interface of the panel. 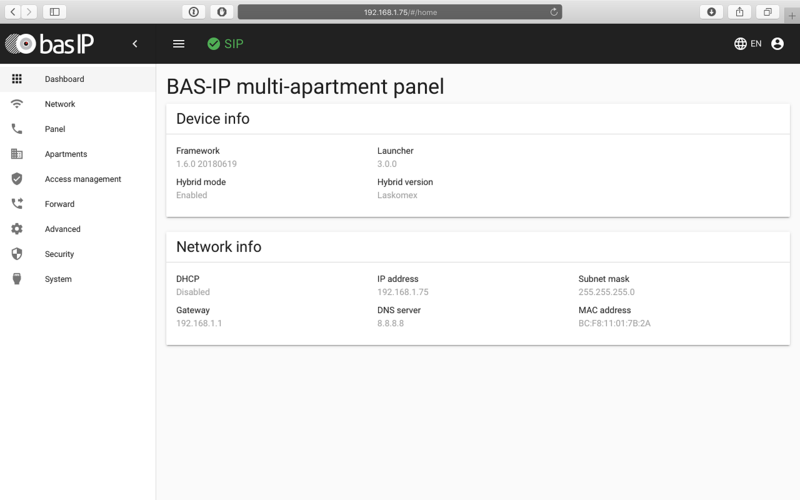 Now BAS-IP outdoor panels can be connected to the framework of third-party software, you can control it. To install the firmware required in the panel, you used to install additional programs on your PC, and using them, install firmware. Once the 3.0.0 firmware is installed, you can update panels through the web interface, which will greatly reduce your maintenance time. 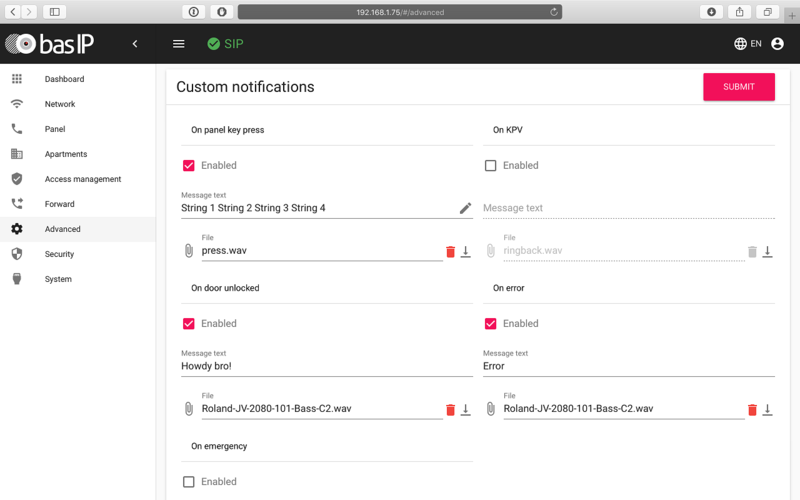 It is now possible to install software updates not only manually by downloading the necessary update file through the web interface, but also by independently checking for updates for the panel on the BAS-IP server or on the custom server. If you check for updates on the custom server, you will need to specify a path to it. You’ll be able to change settings without fear of everything crashing and not being able to be restored. Now you can restore any of the saved settings. This entity allows you to specify apartment address (number of the building, unit, apartment number), apartment name, as well as the number of residents from the panel web interface, and also displays number of linked IDs and access codes to this apartment. It is now possible to add and edit IDs with very flexible access rules. You can specify IDs both for apartment owners and their guests (single or reusable), and also for service staff of building/apartment, who come on specific days of the month/week and at the exact time. You can also specify which doors will be able to open a particular card, so, for example, the water delivery man will not be able to enter the storage room or other utility rooms, where the residents have access. It’s now possible to unlock without without a preliminary incoming call from the panel. It is very convenient when, for example, a security guard or a concierge sees in the camera that a resident has his or her hands full. Then the guard can open the door/passage to the vicinity through the web interface. When this function is enabled, after entering required number of digits (1, 2, 3 or 4 digits) of apartment number, the call to the apartment required will be automatic. For example, you can set number of digits: 2. It means that when you enter an apartment number from 10 to 99, the call will be immediate. But for apartments from 1 to 9 you must additionally press the pound sign. When this function is enabled, after entering an apartment number, you must additionally press (#) or wait 3 seconds, and the call will be ended automatically. 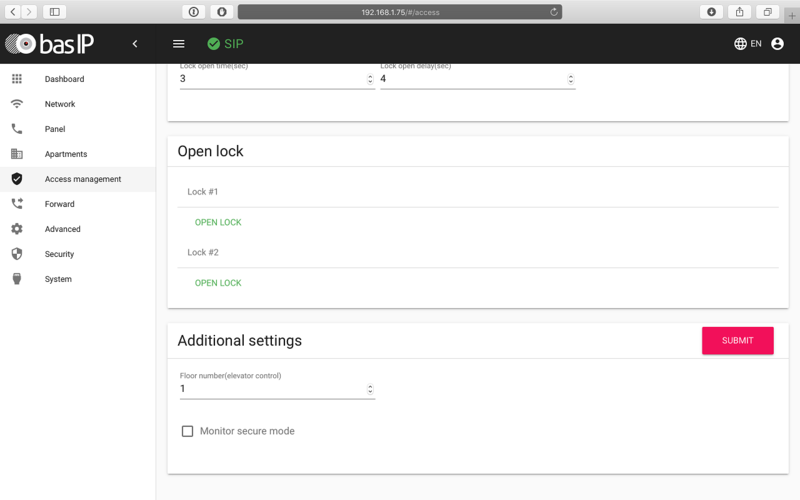 It allows you to see in web interface settings whether panel is hybrid as well as its version (if it is available). This is for service provider or BAS-IP support team know which panel is installed, and they will be able to give corresponding information on how to configure it.